This mod enhances Daggerfall Unity gameplay by making language skills more viable and adding a new guild to the game, called "The Archaeologists Guild". Their mission is to delve into the history of Tamriel and are interested in all creatures and races who have lived or still live there. The guild is a scholarly one and seeks nether attention, power, or riches, but rather knowledge. Its guildhalls are found in smaller towns throughout the Illiac Bay rather than the more expensive and visible cities.The guild is loosely split into members who perform field work, and the more senior members who perform research and are experts in the obscure languages of Tamriel. Essentially contains gameplay changes I would like for my own playing once DFU is released. I hope others find it enhances their play throughs as well. Enable highly intelligent characters who don't use magic to still be a viable playstyle. Sneaking through dangerous dungeons, avoiding or pacifying enemies. Uses potions where neccessary. Provide a balanced in-game method for reducing the massive time-sink that DF dungeons can be with the guild service that provides a locator device for dungeon quest targets. Language skill checks changed so high language skills give a much better pacification chance. Language skills are easier to raise. New guild allows training in all language skills up to the level of characters innate intelligence. New guild provides hand-to-hand training, which is missing in classic. Guild service providing locator device charges that enable enhanced location of quest targets in dungeons. The intent of this service is to balance the atmosphere and epic-ness of dungeons, with provision of an in-game method for players to avoid searching the whole dungeon for hours and hours just to complete a simple quest that gets them 5 rep and a few hundred gold. It will not ensure every quest is successful, but just shortcut hours of very boring backtracking and having to explore every single crevice and cranny in the place. It's not intended to be used in every dungeon, but sparingly due to cost. The locator device is available to any member and provides a magically powered ability to see the quest target location through walls. It will not activate until you have explored a certain portion of the dungeon (25% TBC) and even once activated doesn't help with the labyrinthine mazes, moving elements or magically held locks. Also, to purchase charges for the device you will need to be at least rank of Field Officer. Until that point you will receive one charge for each Archaeologists guild quest taken that requires entering a dungeon. Purchasing charges will be very expensive (4k gp TBC) and will also require a holy tome or dagger to be handed in as well. Rising in the ranks of the guild will reduce this price and at rank 6 you will no longer need to hand in holy items. Since the higher ranks are only available to high INT chars, this allows for characters who are not hoovering loot from corpses to be able to afford charges. The guild obtains the locator devices and charges from a secretive sect of mages who have a different approach to things and do not see eye to eye with the Mages guild. For this reason those with high ranks in the Mages guild (6 and above) are restricted from the higher levels of the Archaeologists. (since they will probably be hoovering up loot and wont need the reduced charge cost either) Gaining reputation with Archaeologists will reduce reputation with Mages Guild. The INT requirement is on top of the usual skill and reputation requirements for ranks. Subject to change during balancing. If you want to give it a try, please do so. It's very early alpha so don't go in expecting a finished guild, but early feedback is very useful. You must ensure that "Allow Custom Assets" option in Advanced/Gameplay settings is enabled otherwise it will not work correctly. Last edited by Hazelnut on Thu Mar 08, 2018 1:49 pm, edited 13 times in total. Updated 22/3/2018 with new guild hall locations. Wow, this is really cool. How did you manage to add it in to the block system and get locations to recognise it? The locator device is available to any member and provides a magicka powered ability to see the quest target location through walls. I wrote an asset replacement class that reads JSON files and substitutes the contents for the blockdata. Currently have only done it so that a single building within a certain block is overridden, and it uses common metadata so cannot be location specific in any way. To create the JSON I have added some world data dump commands, one of which dumps a building into JSON file by using a serializer. Then I painstakingly edited the JSON to make the changes I wanted - actually wasn't too bad because I could edit file, save, then exit & enter building to see the results. I'll be writing up a tutorial at some point so others can make their own guilds & building overrides. I may also extend it so more than single buildings can be changed, but that wasn't needed for my mod and also the JSON would get very large and harder to modify correctly. "So adventurer, if you just head down to crypt X there's an ancient lich residing there..."
"And you want me to stab it in the face until it's dead?" "Oh, oh heavens no. We have some questions for it." But it does legitimately sound cool, focusing on skills and gameplay that weren't particularly used that often. And it certainly opens the door for similar cool mods. Arctus wrote: "So adventurer, if you just head down to crypt X there's an ancient lich residing there..."
That made me laugh! Out loud! You code it, I'll make it I did something minorly similar for a Mages Guild epic quest... I wonder whether I'd adapt that or just make a new one. I'll probably make a new one. Yes, this could be possible with high level language skills actually. So might actually be feasible for high level guild quests... and there's me thinking it was just a funny joke. There is a mage guild quest that has a flat who gets mad (spawns an enemy) and after a while goes passive and give you a message thanking you for not killing them. Not sure how that works. That sounds like one I wrote. 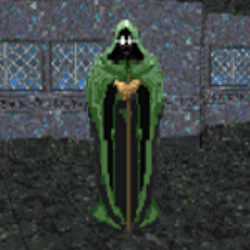 Flat NPCs can be clicked on to interact, so if we made the lich a flat NPC with an image like the Cabal, that would serve the purpose. Actually, Nulfaga's statue could possibly be stretched to that purpose too. I dunno how it would look.